Our last, full day in Sunriver was today. The vacation went by much too fast. I need at least another year here to be fully satisfied. Unfortunately, vacations have to end sooner, and back to reality. Luckily, I have one more day of pure vacation, one half day in Sunriver, and then tomorrow in Sisters, Oregon. Today we packed all of the fun things in. That is what you do on the last days of the trip, you pack it all in. The first thing we did this morning was drive to the stables, and go for a horseback ride. My Grandpa keeps tossing me his keys, telling me that I am driving. It's fun driving their car, but it is also helping me learn how to navigate Sunriver. It can be kind of confusing. At the stables, we checked out to the ponies that Raelyn would be riding, and then we caught a glimpse of the bigger horses that Isabelle, Rob, and myself would ride. Isabelle was incredibly excited. 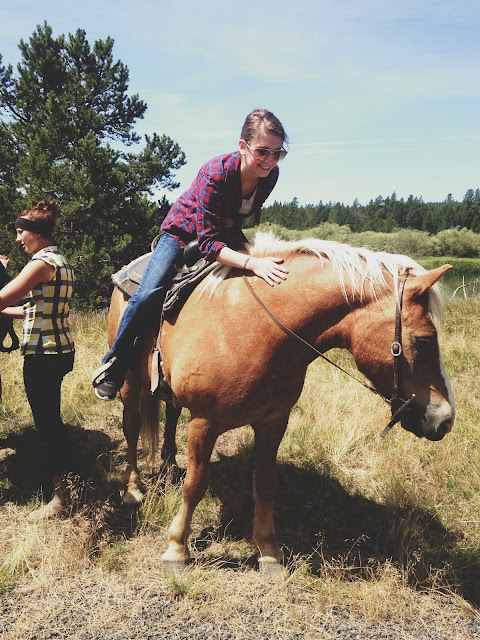 I was also excited for her because this was her first time riding a horse! 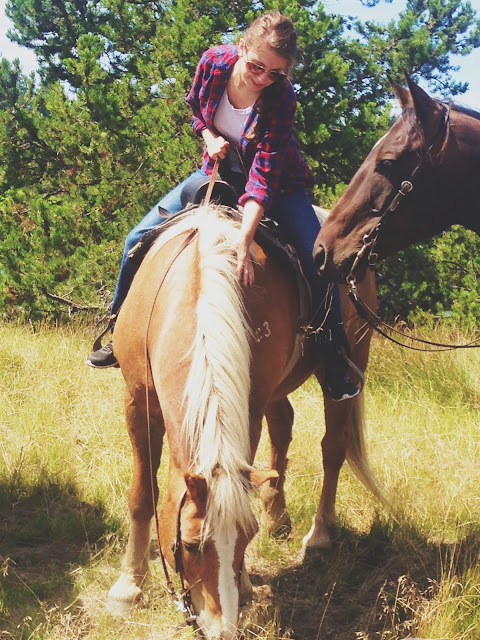 She was such a natural at horseback riding, she did so well! 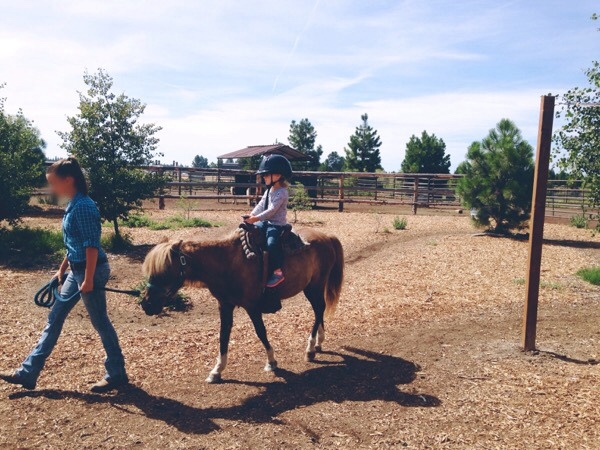 She now wants to take horseback riding lessons, and I hope she pursues that. 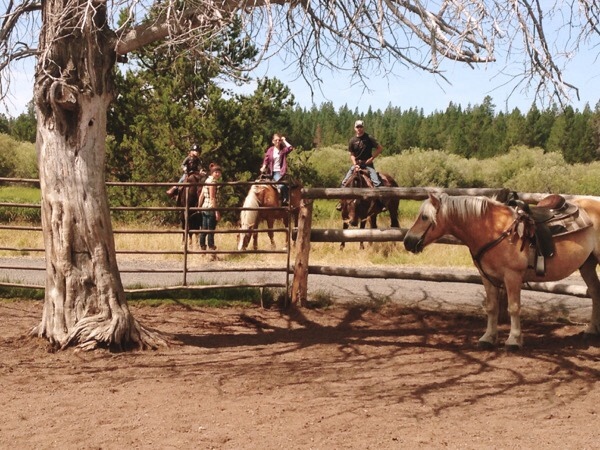 We were signed up for the hour long ride, and we were matched up with horses suited for us. It is amazing how when you saddle up, you immediately connect with the horse you are on. It's a great bond for the rider. I'm sure it is for the horse too, because they are such loyal creatures. My horse's name is Ernie, Isabelle's horse is named Felix, and Rob's horse is Brownie. They were such wonderful horses, and the trail ride was perfect. The trail leaders/wranglers were so nice, and they told us some great stories about themselves, and great stories about the horses we were riding. Also during the ride, we saw a deer, and a coyote! The coyote ran right in front of the trail group, and we were all so close! 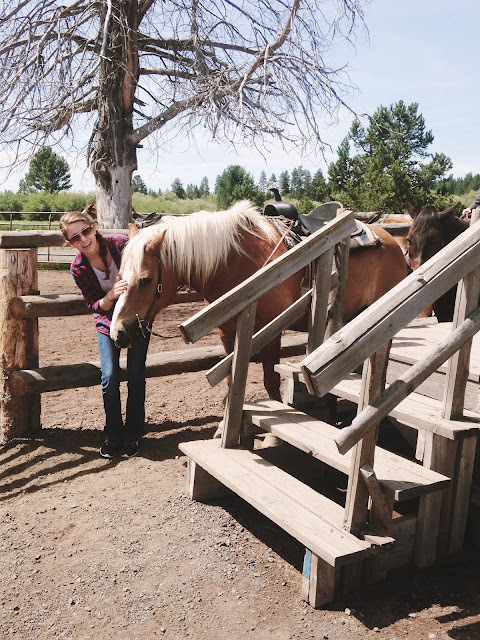 The horses weren't scared at all, they are so used to the wildlife around Sunriver. My horse, Ernie has a look-a-like, and you can guess it, his best bud is named Bert. Yes, they are look-a-likes, best friends, and sleigh pulling partners. In the Winter, Ernie sometimes stays in Sunriver with Bert, and they pull the sleigh together. What the wrangler told us, though, is that Ernie does all the work while Bert is kind of lazy. I was proud that my horse was the hard worker of the two. I kind of fell in love with him. Isabelle fell in love with her horse, Felix too. She had the chance to kiss him "good bye," and she leaft the Stables with a wonderful memory, and such inspiration. 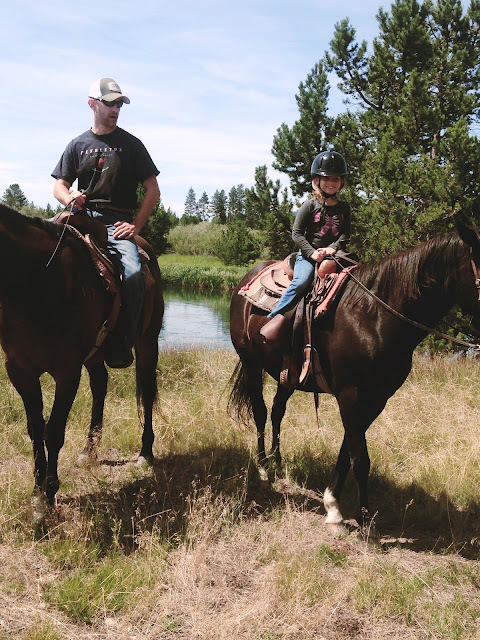 Maybe inspiration that will carry her out throughout most of her lifetime if she gets really good at horseback riding, and possibly competes. How fun! 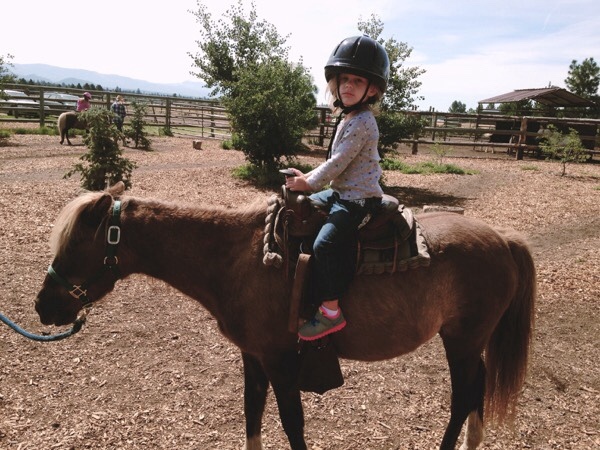 She so enjoyed her first horseback ride, and she will never forget it. 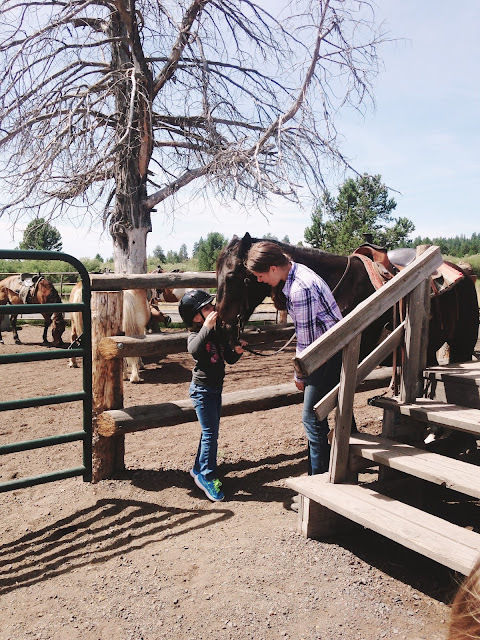 After a fun time at Sunriver Stables, we went home and changed clothes for our next, fun activity. Shawna and Rob wanted to play put put golf, so we went to The Village and visited the Family Fun Center, which used to be Sunriver's ice skating rink. 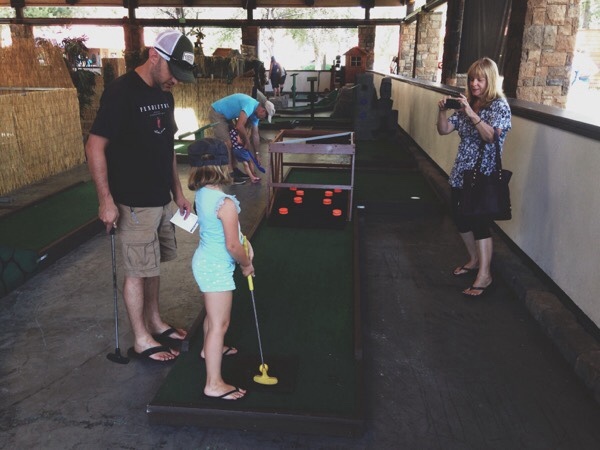 They have reformed it into an area of mini golf, and bumper cars. 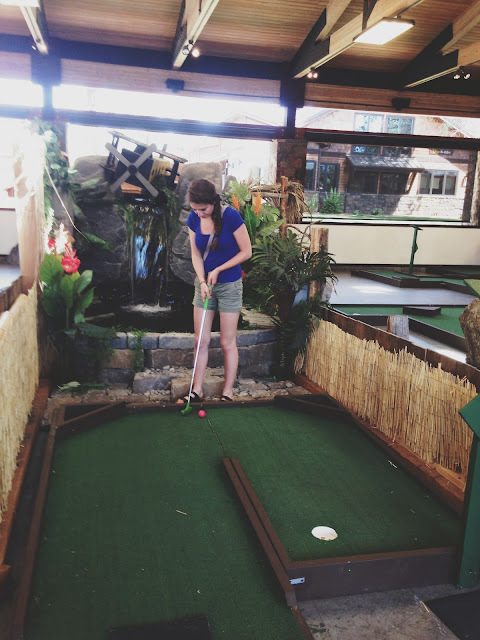 We all played a game, and we all became slightly frustrated with some of the mini courses we had to complete. 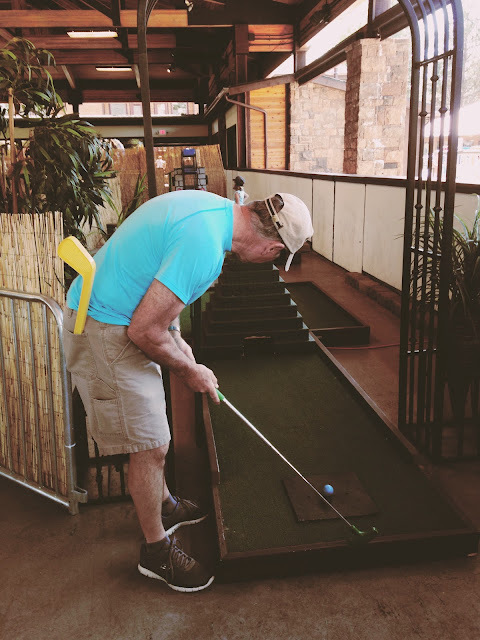 I never got a hole-in-one. 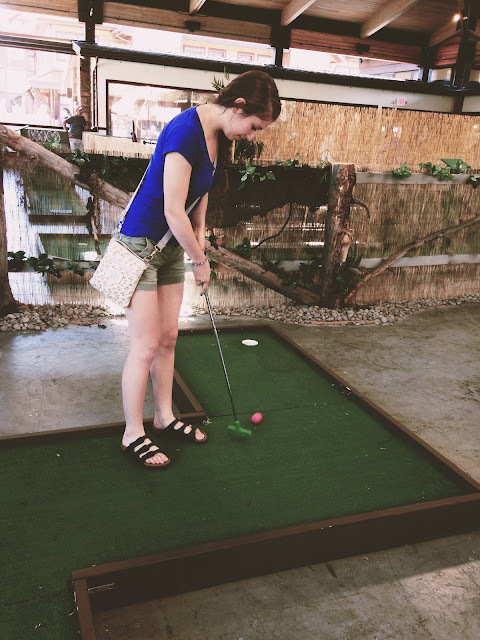 Raelyn got a hole-in-one, Grandma got a hole-in-one, everyone got a hole-in-one during the mini golf but me. I thought it was funny. It was all for fun, and fun it was. After we played mini golf, we stopped off at the house for a second, and changed for Sharc. 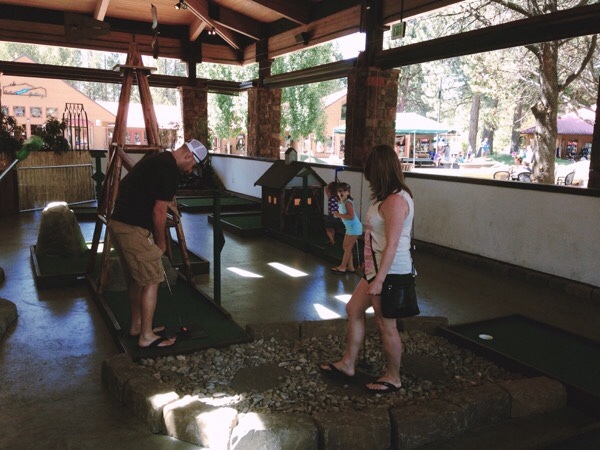 Sharc is Sunriver's biggest waterpark, with fun pools, water slides, indoor pools, hot tubs, and splash pads. It is also a great place to get a great tan! I am still healing from the sun burn that I got a couple of days ago. That was from not putting on enough sunscreen, but today, I made sure to put on sunscreen everywhere. 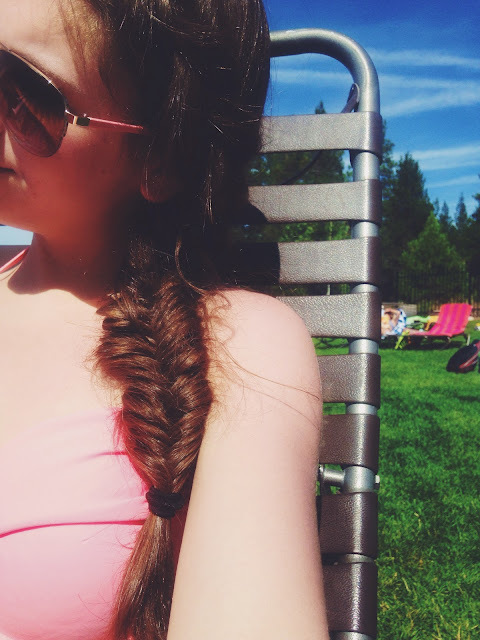 I still got a tan today, and it felt nice to safely lay out in the sun. Surprisingly, I actually went in the water today! I even got my hair wet. I don't normally like to go in the water at waterparks, but Sharc is an experience. So, I went swimming and soaking for a while. It was refreshing, but also my skin felt dry from the chlorine after I got out of the pool. Isabelle amazes me quite often. 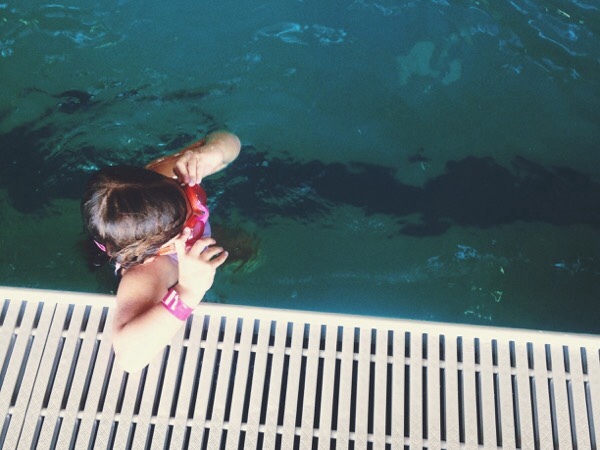 She went in the deeper end of the indoor pool without her floaties, and she is such a great, little swimmer, whether it is the shallow end, or the deep end. She even swam down and touched the bottom the pool! 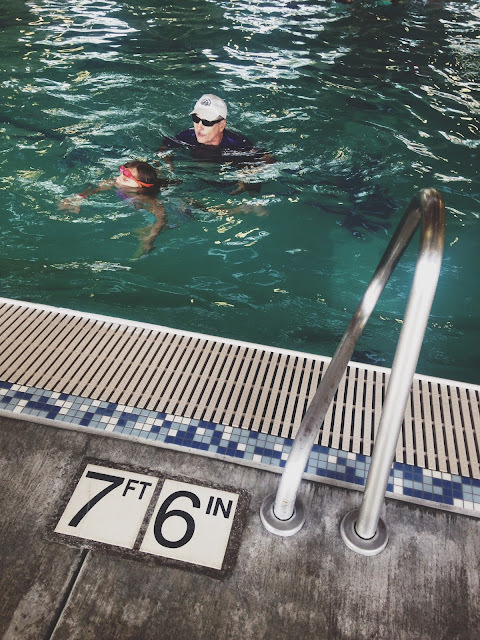 Seven feet, and six inches down, she swam down and touched the bottom of the pool with her hand. Raelyn had fun in the shallow part of the indoor pool. There was an indoor splash pad inside the shallow end of the pool, and a contraption that was like a dump cup. Water filled the cup, and when it got too full, it tips over and dumps all over you. Raelyn loved to stand under the cup, and wait for it to dump on her. It was a great, last visit to Sharc. After Sharc, we were all hungry from swimming, so we ordered a couple of pizzas from Panini's Pizzaria in The Village here at Sunriver. We ate pizza, and then Grandma, Grandpa, and I went on a short bike ride. We needed our bike riding fix, and so we went on a little ride. 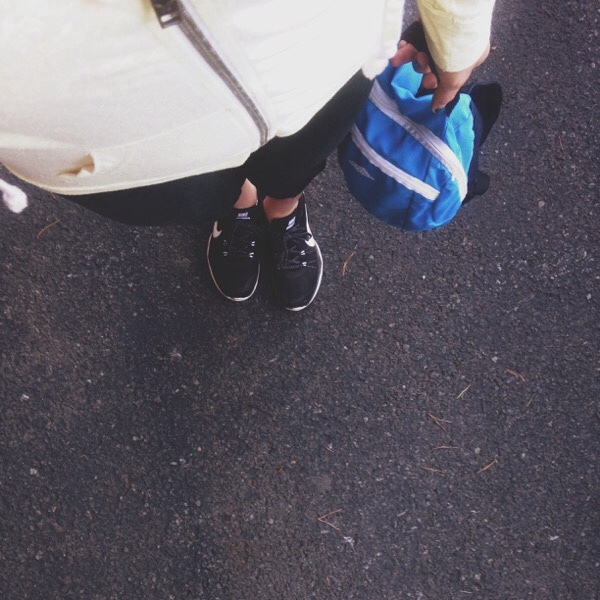 It was a little chilly this evening, so I dressed in warmer clothes, and I absolutely love athletic wear. I should do an athletic wear outfit post sometime. I am, of course sad to see the vacation end, but I am glad to have these memories and I am glad that I had the chance to take a little break, and get away from it all. It certainly regained my creativity, my energy, and revitalized my thoughts. 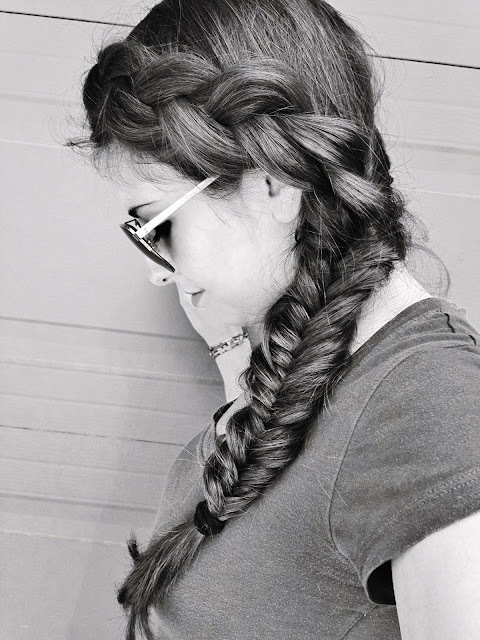 I feel wonderful, and I am inspired by all that is around me. I hope everyone had a fantastic Thursday! I'm going to rest up for tomorrow's road trip back home.